Order now to secure your in the first batch! The ONLY spring kit to keep Fords patented Force Vectoring. The new pro kit by Eibach is arriving @ Pumaspeed in April. This is an opportunity to be amongst the first in the world to experience the best lowering springs for the Mk8 ST Fiesta. The Mk7 Fiesta,Mk2 and Mk3 Focus Springs made by Eibach UK took the tuning world by storm and remain one of our best selling products for these cars. Unlike other lowering springs currently available on the market, Eibach have been working alongside Ford to offer a setup which maintains the game changing load based torque vectoring springs which come as standard on the new ST. Other spring manufactures have gone with a more traditional approach due to simplicity but the engineers at Eibach weren't happy unless their springs incorporated Fords new suspension technology to work in perfect harmony with the Mk8 Fiesta ST. This gives the best response and feedback on the road and track. Giving you more confidence in getting the most out of the brillaint chassis Ford has given the MK8 ST.
As you can see from the photos of our development car they sit perfectly without ruining the ride comfort. These springs will also be backed by Eibachs 5 year warranty. prototypes. The conclusions from the test drivers were very similar. response of the vehicle." - See table for Ford Test driver evaluations. The Pumaspeed Workshop team are ready to fit the Eibach Pro-Kit Lowering Springs Fiesta ST Mk8 in our Head Office located here. We estimate the labour time to be approximately 2.25 hour(s) costing £175.50 inc VAT. Therefore making parts and labour a total cost £395.48 (inc. VAT). 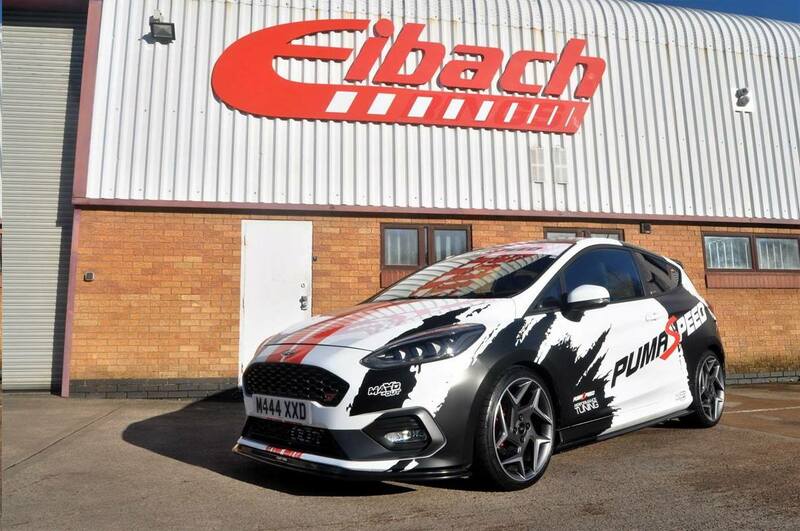 Pumaspeed have a specialist distribution team that can dispatch the Eibach Pro-Kit Lowering Springs Fiesta ST Mk8 to any destination worldwide.